St. Gemma was born Maria Gemma Umberta Pia Galgani on March 12, 1878. She was born in the hamlet of Borgo Nuovo, in the provincial town of Capannori. She was the fifth of eight children. Her father Enrico Galgani was a prosperous pharmacist. Her parents moved the family to the Tuscan city of Lucca shortly after her birth to improve the children’s education. Soon after her mother contracted tuberculosis and Gemma was placed in the care of a private nursery school, where she was determined to be a highly intelligent child. Five years later her mother died from tuberculosis as well as her oldest brother Carlo, and her brother Gino who was studying for the Priesthood. She also lost her youngest sister Giulia at a young age. Gemma was sent to a Catholic boarding school in Lucca run by the Sisters of St. Zita. She excelled in French, Arithmetic and Music. Gemma was allowed at the age of nine to receive her first Holy Communion. She wanted to become a Nun with the Passionists, but because of poor health and her heavenly visions, she was not accepted. At the age of 20, she developed spinal meningitis, but was miraculously healed through the intercession of Venerable Gabriel of our Lady of Sorrows, who was later canonized, and St. Marguerite Marie Alacoque. Shortly after she turned 18, she was orphaned. She was responsible for the upbringing of her younger siblings, with the help of her aunt Carolina. She declined two marriage proposals and became a housekeeper. Soon after, Gemma began to display the signs of the stigmata on June 8, 1899, at the age of twenty-two. She had spoken with her Guardian Angel, Jesus, the Blessed Virgin Mary and other saints, especially Gabriel of Our Lady of Sorrows. She sometimes received special messages from them, about current and future events. With her health in decline, her spiritual director directed her to pray for the disappearance of her stigmata; she did so, and the marks ceased. She also was able to resist the constant attacks of the Devil. Many times she was found in a state of ecstasy. She also was reported to have the gift to levitate. In one instance in the dining room of her home, was a large crucifix that was highly venerated by the whole family, particularly Gemma. She claimed that at least once that she found herself raised from the floor with her arms around the crucifix while kissing the wound on the side of the Jesus crucified. St. Gemma was one of the recipients of the Holy Wounds of Christ. She tells what took place when she received the Holy Stigmata, on June 8, 1899, a Thursday evening, on the eve of the feast of the Sacred Heart. She writes, “I felt an inward sorrow for my sins, but so intense that I have never felt the like again… My will made me detest them all, and promise willingly to suffer everything as expiation for them. Then the thoughts crowded thickly within me, and they were thoughts of sorrow, love, fear, hope and comfort”. St. Gemma then experienced a rapture in which she saw her Guardian Angel in the company of the Blessed Virgin Mary. She tells what took place next, “The Blessed Virgin Mary opened her mantle and covered me with it. At that very moment Jesus appeared with his wounds all open; blood was not flowing from them, but flames of fire, which in one moment came and touched my hands, feat and heart. I felt I was dying, and should have fallen down but for my Mother, the Blessed Virgin Mary who supported me and kept me under her mantle. Thus I remained for several hours. Then my Mother kissed my forehead, the vision disappeared and I found myself on my knees; but I still had a keen pain in my hands, feet and heart. I got up to get into bed and saw the blood was coming from the places where I had the pain. I covered them as well as I could and then, by the help of my Guardian Angel, got into bed”. In early 1903, Gemma was diagnosed with tuberculosis and began a long and often painful death. There were numerous extraordinary mystical phenomena that occurred during her final illness. One of the religious nursing Sisters who attended to her stated, “We have cared for a good many sick people, but we have never seen anything like this”. At the beginning of Holy Week 1903, her health quickly deteriorated and by Good Friday she was suffering tremendously. She died in a small room across from the Giannini house on April 11, 1903, Holy Saturday. After a thorough examination of her life by the Church, she was beatified in 1933 and canonized in 1940. Her relics are housed at the Passionist’s Monastery in Lucca, Italy. She was beatified within 30 years from the date of her death. She is one of the very few saints that have had sainthood conferred on them in this short of time. 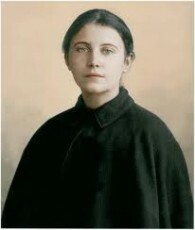 St. Gemma Galgani was one of eight children. She was called to the religious life at an early age, but was rejected due to poor health. She was orphaned after tuberculosis took her parents and some siblings, being left with the responsibility to raise the rest. She had many ecstasies, including levitation to a large cross, embracing the Crucified Jesus. She also had the stigmata, and a supernatural closeness to the Blessed Eucharist. She felt totally consumed by Jesus in the Blessed Sacrament, and had many writings in her journal about this. She eventually came down with tuberculosis and died at the age of 25.